There exist several techniques to reduce the wrinkles and ridules face and/or neck. The choice depends on the localization of the wrinkles, their depth, their form and desired result. It is a product of filling résorbable, it is naturally present in the derm and has as a function to retain water in the deep layers of the skin in order to maintain the hydration of it; being component naturally present in the organization, there is no phenomenon of allergy or of rejection thus can be used without danger. The wrinkles are filled by injection of this substance inside the wrinkle; this treatment is carried out with the consulting room of the doctor under local anaesthesia. Small rednesses and small oedemas can appear thereafter, but reabsorb in 48h to the maximum. The result is visible immediately, it is natural but not final, its duration varies between 6 and 12 months. Botox causes an inhibition of the muscle and prevents it contracting what causes to slacken the skin and from smoothing the wrinkles of expression. 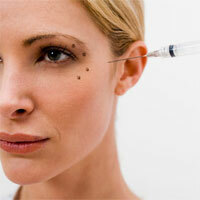 The substance is injected directly into the muscle by ultrafine needles (painless). The botulinic toxin is used to correct the goose legs, the wrinkles with the corner of the lips and the wrinkles of the face. This act is carried out with the consulting room of the doctor under local anaesthesia. Small rednesses and a small oedema can appear but reabsorb at the end of 48h. The results are visible at the end of a few days and persist approximately 6 Traitement months with the Laser: the light penetrates the vessels and stimulates the answer of natural cure of your body to build collagen and thus to make disappear gradually the wrinkles and scars. It is a technique which consists of taking away of fat in a provided part of the body, this grease is then centrifuged before being reinjected in the wrinkles to fill them or reorganize the face. It aims to give again a blow of glare to the face and to renovate its appearance. It is acted in fact of eliminating the cells dead from the skin, which causes a reaction of the organization which will manufacture a new skin. Two types of treatments are possible. This technique consists of a mechanical sandpapering of the skin using a surgical grinding stone which will use the surface layers of the skin; it makes it possible to erase the ridules, the marks of pregnancy, certain scars, to improve quality of the skin and to give him a new glare. It is carried out at the doctor's office under local anaesthesia, the duration of the cicatrization is from 2 to 3 weeks. It consists with the application on the face of a liquid or a mask containing acid; this mask will eliminate the surface layer from the skin and will support the appearance of a new skin.